Atik One with 9 MPixel cooled CCD sensor. Integrated and powerful, the Atik One series embodies Atik's principles bringing you a high performance, simple to use platform, with internal filter wheel, all in a very compact and light package. It features an improved cooler, capable of reaching a stable -38ºC below ambient, and a new CCD chamber design, filled with high purity Argon, for a dry, condensation free environment and optimal thermal insulation. Convenience of use has been key during the design. The Atik One also features an internal USB hub and accessory power port, so that you can keep the cable clutter under control. Only 2 cables for your imaging gear! In addition to this, two 1/4" tripod mounting holes are available, to give you more options for mounting the camera, other accessories, or for managing the cables. 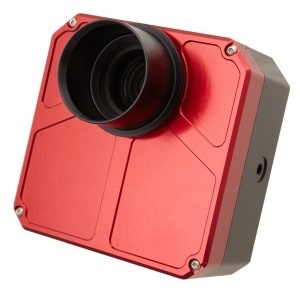 The 5 position integrated 1.25" filter wheel features a mechanical roller for filter location ensuring the highest levels of reproducibility image after image. The filter wheel is natively controlled from our software or has an Ascom driver for 3rd party programs. To make filter changing less of a chore the camera comes with a tool to allow filters to be loaded without opening the camera. The Atik One series is the culmination of our efforts to bring you the finest scientific grade CCD camera available in it's class.